Free Resources for the 12 Templates and the Horizon Storyline. 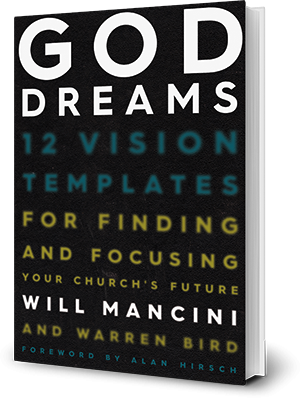 Will has created a PDF overview of the Vision Frame just for God Dreams readers. The Vision Frame is the master tool of Church Unique and can be used as a simple napkin sketch or whiteboard drawing with your team. It is designed to convey the answer to the four irreducible questions of clarity before you do your visionary planning. The Horizon Storyline as master tool for visionary planning snaps into the Vision Frame. While the master tools can work independently, they are designed to work together. In Church Unique, Will wrote a chapter entitled, “The Rise and Fall of Strategic Planning.” Since this chapter relates to the topic of planning, you can download the entire chapter for free. These are some of the prayers and related scriptures that Will and the Auxano team use when facilitating with church teams. Use and adapt them for your own team facilitation. When working with the 12 Templates, there are three additional exercises that Will references for selecting your top one or two templates as a team. These exercises include the Visionary Style Exercise, the Church Achievements Exercise, and the Team Member Ultimate Contribution exercise. As you build out your vivid vision description from your one picture idea, Will references several free online tools. The links can be found in one place in this Metaphor Tools PDF. The ultimate tool for keeping your Horizon Storyline updated is this PDF form. It is the form that Will and the Auxano team use with church teams. Take a picture of your Horizon Storyline and send it to Will via Twitter (@willmancini) or Instagram (will_be_clear) for a chance to win a free gift.